Thank you to everyone who linked up a project this week on the Inspiration Board. There were so many amazing projects to look at. I hope you enjoyed visiting the other links as much as I did. Here are a few that I’m spotlighting this week. The Gunny Sack made these "oh so autumn" floating candles from acorn caps. I love acorn projects and this one is really original. 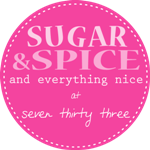 Learn how to color candy at Paper Vine. Use store bought plain candy and color it to match your party theme. Great idea! Faux Cubbies by West Furniture Revival. I love the cubbies but equally love the wonderful décor items thoughtfully placed inside. Jelly Fish Jelly teaches us how to make a homemade kaleidoscope. Great for big and little kids. Who isn’t fascinated with the changing colors of a kaleidoscope? Beautifully crafted yarn-wrapped letters by Uncommon. The little bats add just the right touch against the white mantle. Describe Happy made this gorgeous quilt in some of my favorite colors. I couldn’t resist using this image with her furry friends (to see better pictures of the quilt visit Describe Happy). I selected this photo because I love it when things that we make are used rather than stored away. I’m sure this quilt will be used for snuggling with these guys for many years. What a great little boy’s room by Max and Emerson. The road spells out Max and continues onto the next wall. Adorable. Wonderful yardstick art by Artful Panoply. The best part – the yardsticks were purchased at a garage sale for 75 cents – for all of them. What a great find. Beautiful palette art perfect for fall from The Creative Paige. The different colors of each board make this piece all the more interesting. Upcycled detergent tins turned into beautiful fabric covered vases by Frugalicious Me. I love the breath of fresh air these springtime colors bring to the party. Blue Chateau Interiors brings Venice to our screens with beautiful photography. The scenery and her photography are just spectacular. I’m expanding the Color Board that I spotlight each week and changing it to a Pin Board. This gives me more options to spotlight not only color but other categories. Please come back next week for another link party. Link parties are held every Tuesday. Awhile back I noticed that a Eucalyptus tree was being trimmed at a nearby park. I asked my teenage son to get me a branch next time he was over that way –you know, because you never know when you may need a Eucalyptus branch. Actually, I was thinking maybe a few twiggy branches to put in a vase or to make a pretty wreath. I didn’t realize that he gathered some friends and on their skateboards they all dragged several large 10 foot-plus branches home for me. More Eucalyptus than I could use in a lifetime. Sadly, the branches weren’t usable because they had some sort of bugs. The boys didn’t seem to mind. I think they thought it was pretty funny skateboarding down the street dragging huge branches. I was able to salvage the pods and used them in this vase to prop up my candles. Thank you boys! The Eucalyptus pods smell great and are a nice fall touch. I love these pretty decorative pins by K&Company. These pins are usually used in scrapbooking to attach little bits of trim or ephemeral pieces to projects. I wasn’t planning on using these pins on any upcoming projects and they were too pretty to tuck in a drawer so I decided to display them. I used an embroidery hoop, a piece of vintage linen and some leaves cut out of felt as a backdrop for my pins. These pretty pins are ready to display and use for future craft projects. Welcome to The Inspiration Board link party. 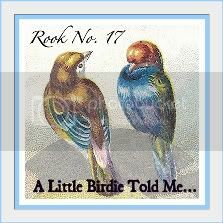 It really has become my favorite blog day of the week. I just love looking at all your projects and visiting your sites. If you don’t have a project to link up, please stay awhile and visit some of the links. Thank you for visiting and I would love it if you made someone smile with a comment or two. The Dirt: Bulbs. Dig, Drop, Done. Who doesn’t love a pretty garden? Even if you don’t have a yard and a lot of time, there are many options to enjoy beautiful flowers. So when I was introduced to the website “Bulbs. Dig, Drop, Done.” I was intrigued. Like so many of you, I’m pressed for time – digging, dropping and being done sounds great. The site is full of inspiration. From Bulb Basics which teaches you how to start planting, Bulb-Pedia that offers information on the different varieties of bulbs and there’s even an Inspirational Gallery. I love this porch featured in the Inspirational Gallery. The pot of flowers is the perfect touch with the fun garlands and painted furniture. This is exciting. Bulbs.Dig,Drop,Done is giving away a $5,000 yard makeover. To enter, simply submit a photo of your yard at CurbsideChaos.com. The lucky winner will not only receive a $5,000 yard makeover but HGTV host, Taniya Nayak will visit the winner and offer tips on the best way to update their yard, including of course, incorporating bulbs into the landscape. When you visit curbside chaos to enter, there’s a handy Garden Guru Tool. The tool helps you identify which bulbs are the best for your areas. You pick your country, location and choose the type of bulb you want to grow. 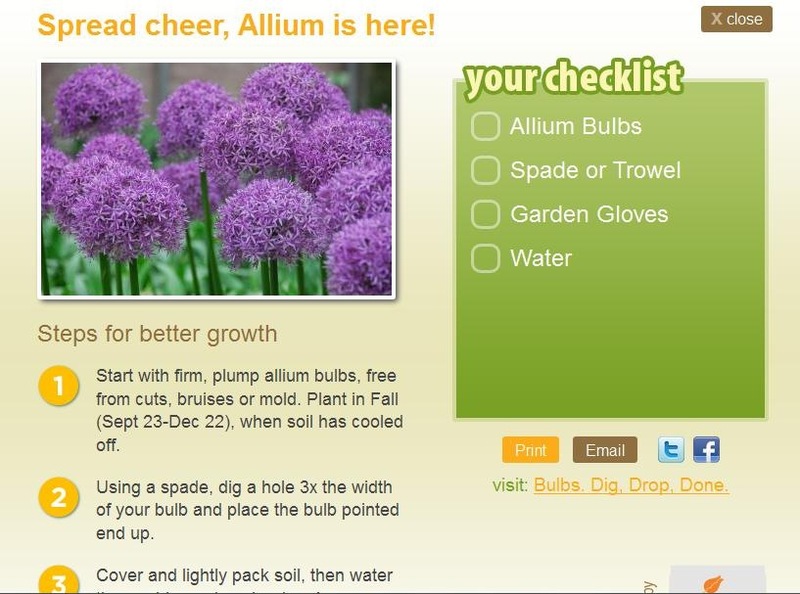 I chose Allium and the Garden Guru provided me with step-by-step instruction on how to grow these flowers. I can’t wait to see those beautiful purple flowers in my yard. 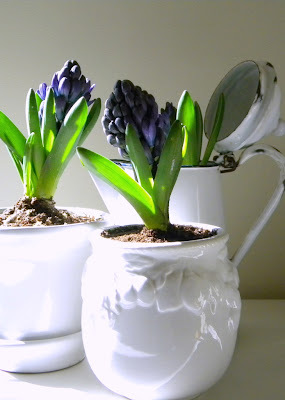 Even if you’re not a gardener, bulbs are so easy to grow. I love incorporating bulbs into my décor. Here’s what I did last year. I can't wait to get planting this year. There were so many wonderful projects linked up this week on The Inspiration Board. My project list is growing thanks to all of your great ideas. Thank you to everyone who linked up a project. I hope you enjoyed visiting the other links as much as I did. Felt Acorns by The Gunny Sack. Natural acorn caps top off the little bits of felted fiber. Show Tell and Share made this delicious looking pear butter. What a great gift item this would make. A beautiful patch on point quilt by French Knots. I love the fabric choices and the black background is so unique. One Day at a Time created a pink bridal shower with a touch of metallic. I chose to show this beautiful shot of the metallic detail but head over to One Day at a Time to see the pink images. Great chicken wire pumpkins by Dreaming in Color. 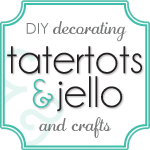 Chicken wire is being used in a lot of crafts lately and I’m definitely putting it on my list of craft supplies. Fabric pumpkins by Brown Paper Packages. The autumn leaves and berries are the perfect touch. Messy Mimi gave new life to this cane chair with a coat of paint and new fabric. I’ve seen a lot of yarn wrapped wreaths but this crochet yarn wreath by Plus 3 Crochet is so unique. I love the crochet edge and the sunny yellow color. 1. Adorable little monster mirror by One Art Mama. 2. Check out this haunted house light by Oasis Accents. A great upcycle from an old frame. 3. Painted bottles with a fun Halloween twist by Messy Roost. These are truly amazing. They’re cookies that Arty McGoo frosted and then painted. Absolutely little works of art. I’m speechless! I usually also spotlight an inspirational color of the week but this week, I was inspired by all of the beautiful textures and fibers.